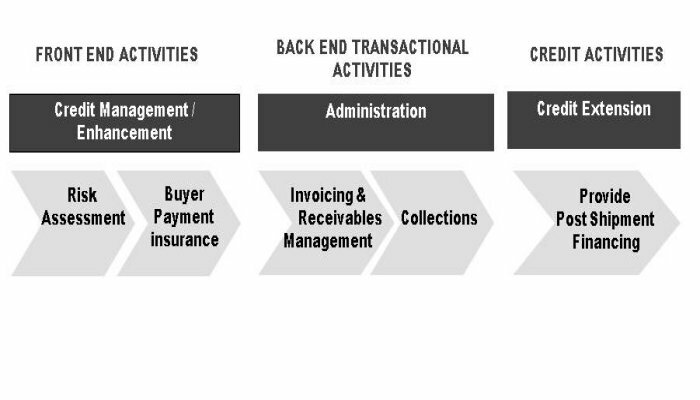 Like any good lender, companies must assess their buyers for the ability to pay and also provide an internal credit line for them to order goods. Credit limits to your customers allow them to order goods up until the limit and is the maximum amount you are willing to risk. Companies use different criteria to determine a new credit limit. The hardest part is to give a new buyer a limit as there is no trading history. Many companies will use various financial ratios and categorize their buyers into risk categories, no different than when a bank does that to its’ consumer or business customers. This determines the amount of credit that will be provided. Companies sometimes use a credit bureau as a benchmark. The first question to start out with is just how long your payment terms are – the longer the term, the more future sales will be impacted by prior sales. Is there a high degree of competition or substitution for the product or service being sold? What is the buying industry growth rate? Are margins under pressure or is the industry in growth mode? What financial information can you get from your customer? Are you able to get bank references? Do you have solid credit analysts on your team or must you outsource to third party credit bureaus or others? What formulas and/or criteria are companies using to come up with a credit limit based on customers' financials (i.e. percentage of net worth, etc.)? I believe one area to watch is how much debt your buyers have, especially in this day of corporate leverage. Are all your sales on open account or can you use a letter of credit? While using an L/C is cumbersome, it provides a good tool for credit risk management. The challenge is that L/Cs requires your buyers to have a credit line. Can you buy trade credit insurance or credit default swaps on the buyer? What is the overall margin of the product or service and what loss rate can you assume? Just like credit card companies build in a loss factor to increase card volume, so should you. How much confidence do you have in your in-house collections team and process? How long are your sales contracts? Setting credit limits is both an art and a science. There are very good industry groups out there that provide forums to ask questions, including the Financial Credit & International Business Association. Regardless, don’t forget to review your system from time to time. After all, experience is a good teacher and if you are experiencing higher or lower than “normal” losses, adjustments may need to be made. What are companies doing out there to develop best in class around setting credit limits? I would love to hear from you.